All Throughout St Michaels and Bay Hundred Area! Flattest, Fastest 13.1 in the Mid Atlantic! 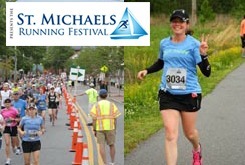 The St. Michaels Running Festival is one of the premier destination races in the Mid-Atlantic. Held in one of the oldest waterfront towns on the Chesapeake, St. Michaels and the Bay Hundred runners will be treated to beautiful farm lands, gorgeous water views and a rockin' after-party in downtown St. Michaels. The St. Michaels Running Festival also has a family friendly 5K and a kid's 1K fun run. Not running? Come cheer on the runners/walkers then head into town to eat, shop, play and stay!